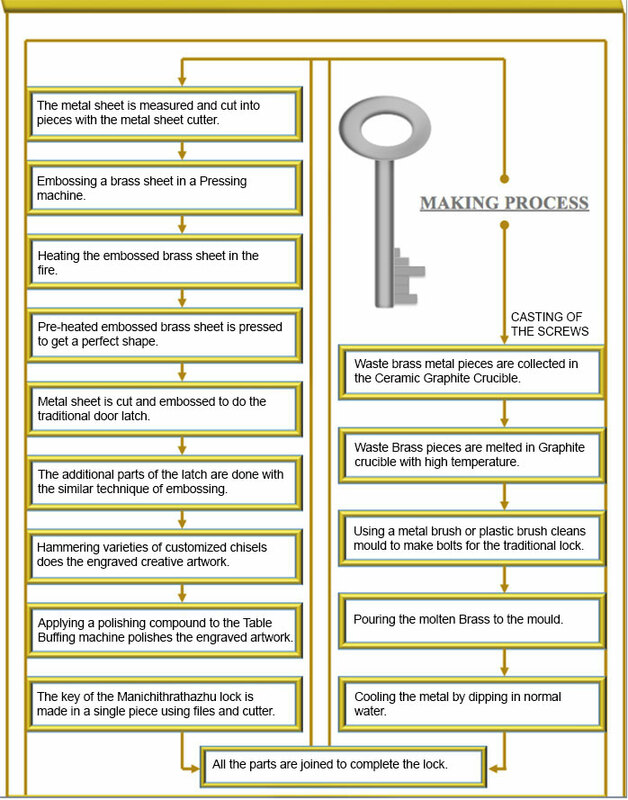 Brass metal sheet is the basic raw material for Manichithrathazhu locks. The sheet is measured and marked from all the four sides with the help of L-shaped right angle scale and marker to get an exact square shape. Using Metal sheet cutter, the marked metal sheet will be separated in to parts. 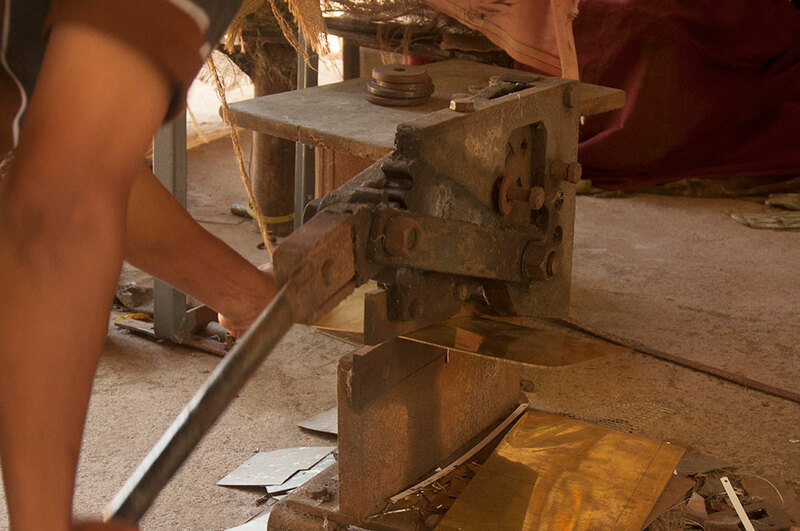 Brass metal sheet will be pressed to emboss in to a required shape by placing the customized impression tools and Pressing machine. 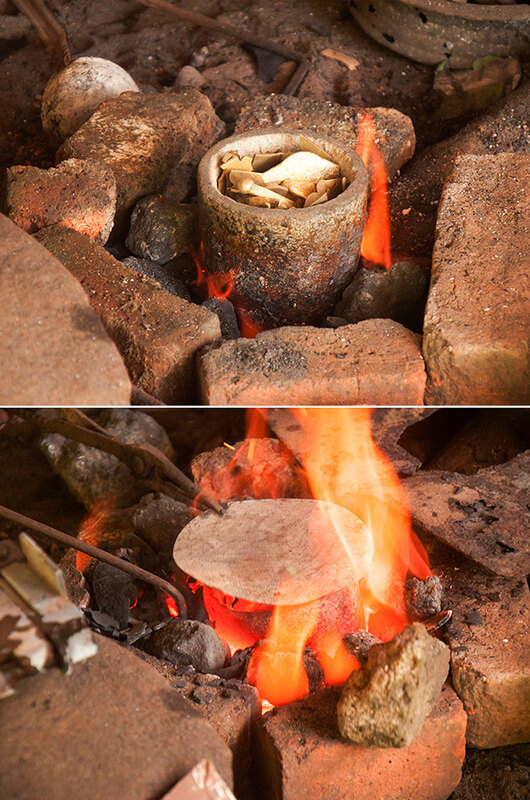 Charcoal of coconut shells are used to heat the embossed craft piece by applying a mixture of soil and mud with water to the furnace leaving a small hole in the middle of the Traditional wind blower and by creating a furnace. Once done with the heating, craft piece is cleaned with the help of brush. 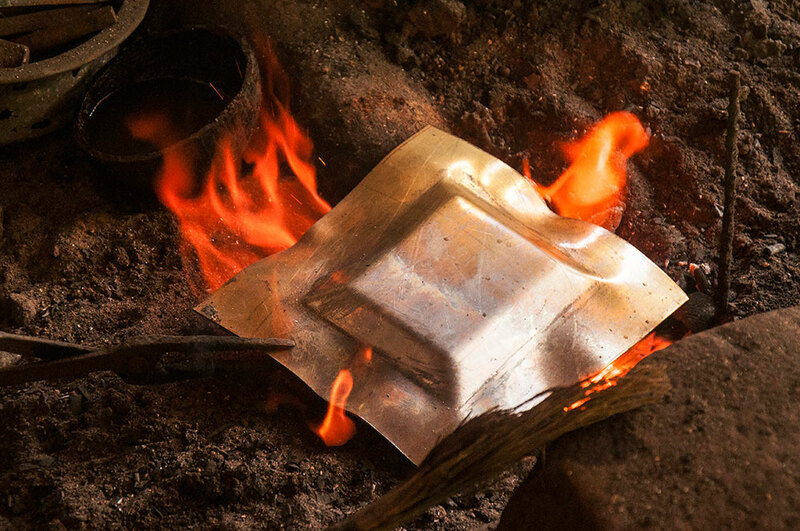 After heating an embossed craft piece, again pressing will be done slowly in a pressing machine to make it soft to shape easily. 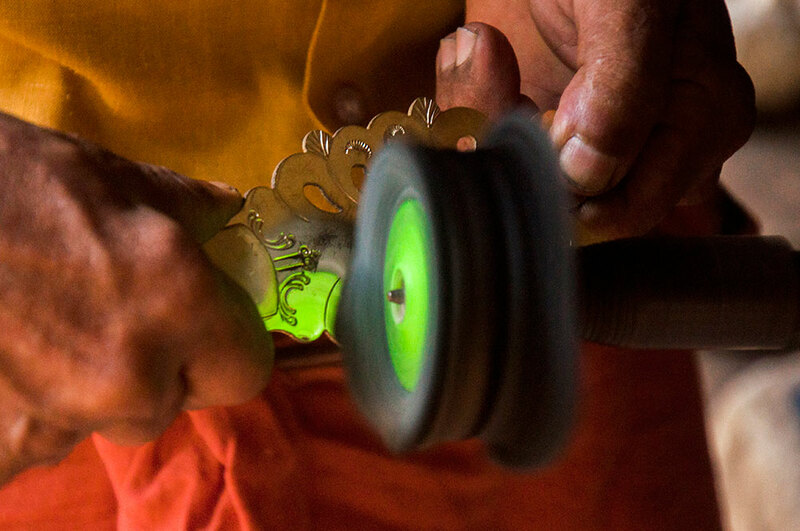 The heating and pressing process will be done for two to three times to get a perfect shape with minus cracks. 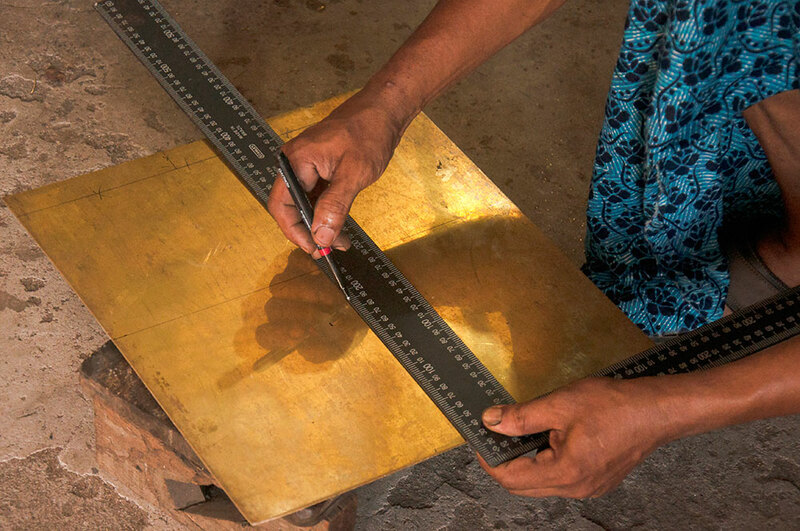 Brass metal sheet is cut into a required shape. 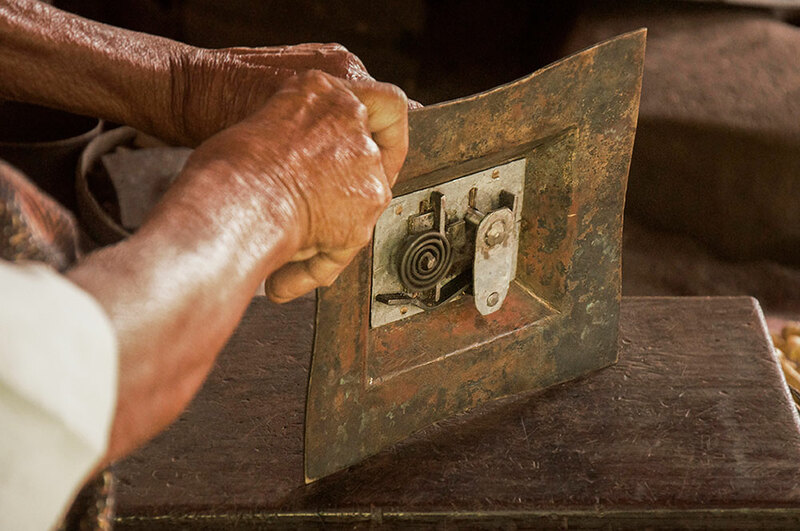 Embossing a parted metal piece by replacing a different impression tools in the Pressing machine by moving the wheel to get a preferred shape. 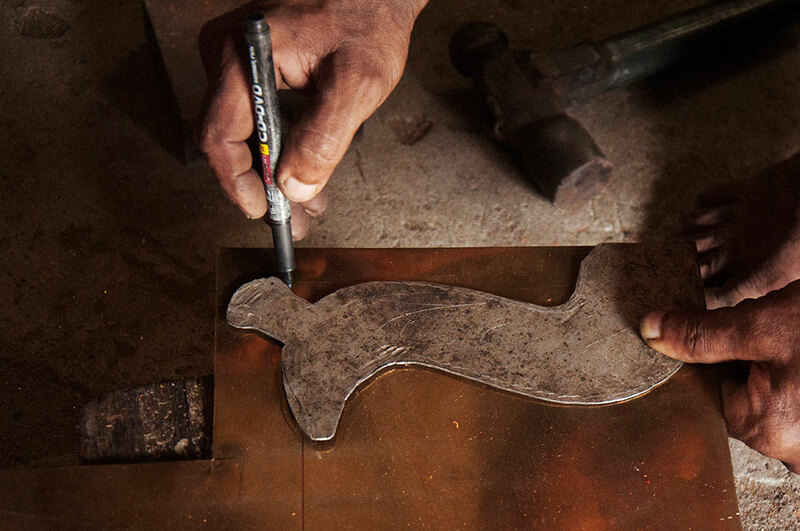 The metal shaping will be done according to the selected design. 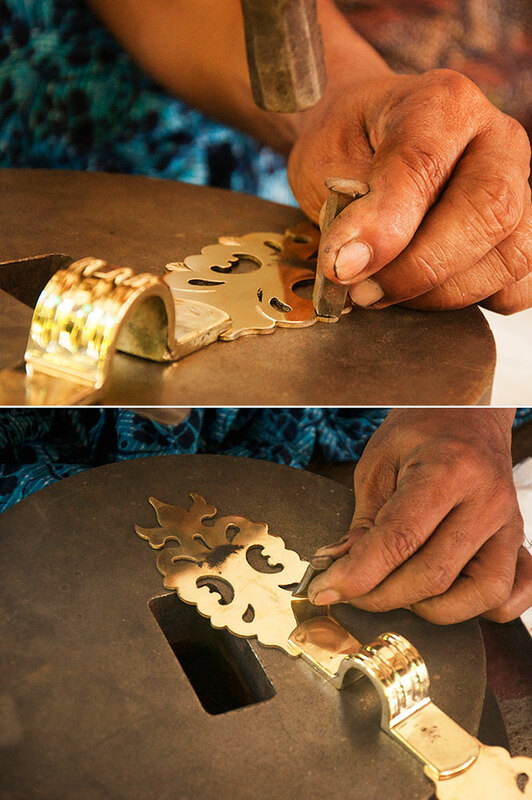 Once ready with the embossing, two sides of the traditional door latch (trishul shape) are joined with small screws. Using cutter and files, sharp edges will be smoothened and the unwanted things will be removed. The additional parts of the door latch will be done in the same manner and joined together to make it solitary which is movable to lock and unlock the lock system. Once done with the trishul part, artistic work will start. 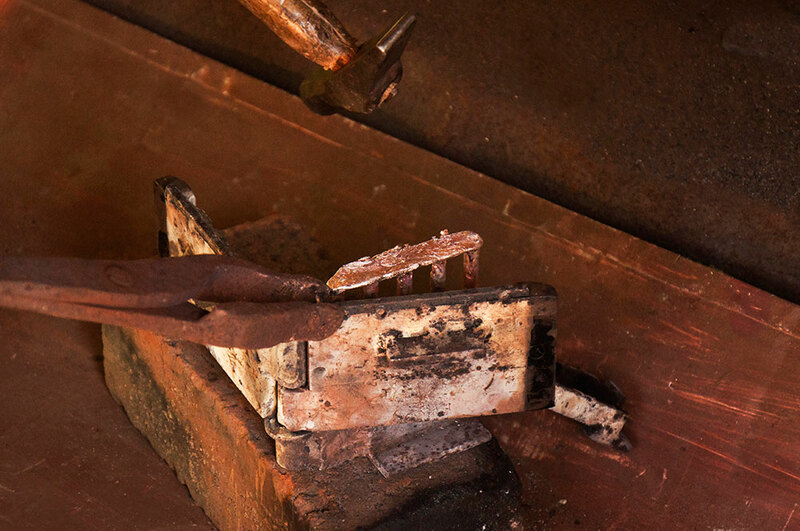 Hammering varieties of customized chisels does the beautiful artwork on the lock. These special locks have a unique key, which is made in single piece. 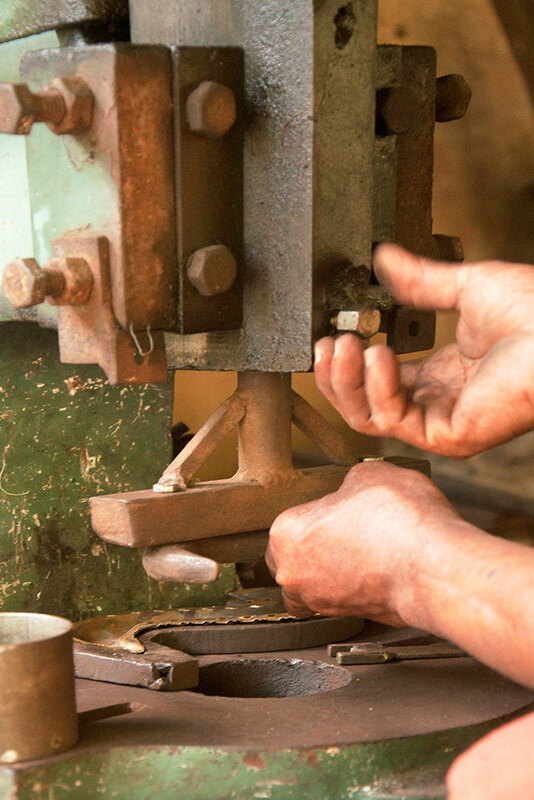 The main artisan will do the important part the lock system. 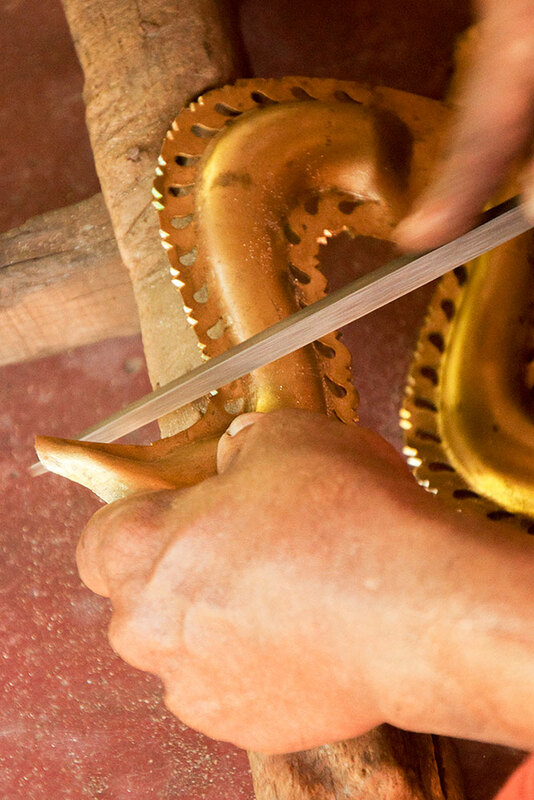 Though he (Sridharan) is skilled, he does the interior part of the lock. The key is done with a single piece by using a cutter and filer to get the faultless and safe keys for the locks. The lock sounds like a bell sound while unlocking and locking. There are two types of lock, single lock and double lock system. 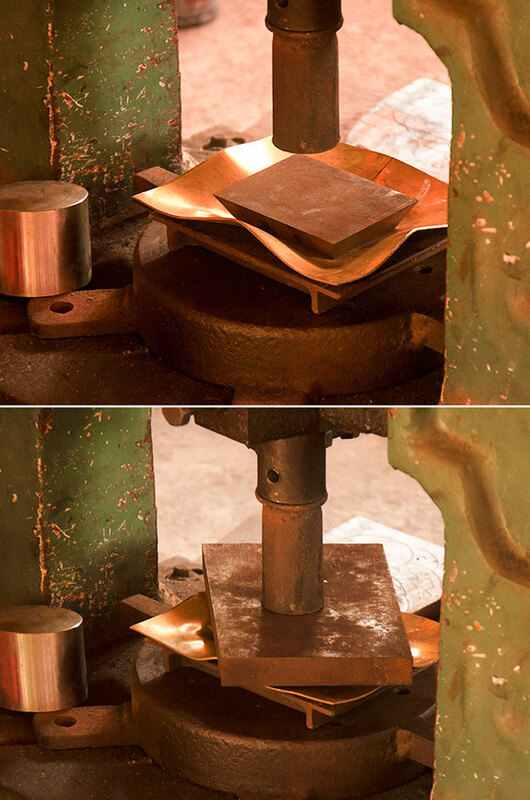 The polishing compound is used to get the shining surface by applying it to the Stationary table-buffing machine. They use different wheels for different surface like matt finish, glossy finish and antique finish. The interesting part is moulding and casting for the screws. They make screws by themselves to fit the door locks. Initially mould is cleaned by using a metal brush or plastic brush to develop a good mould. 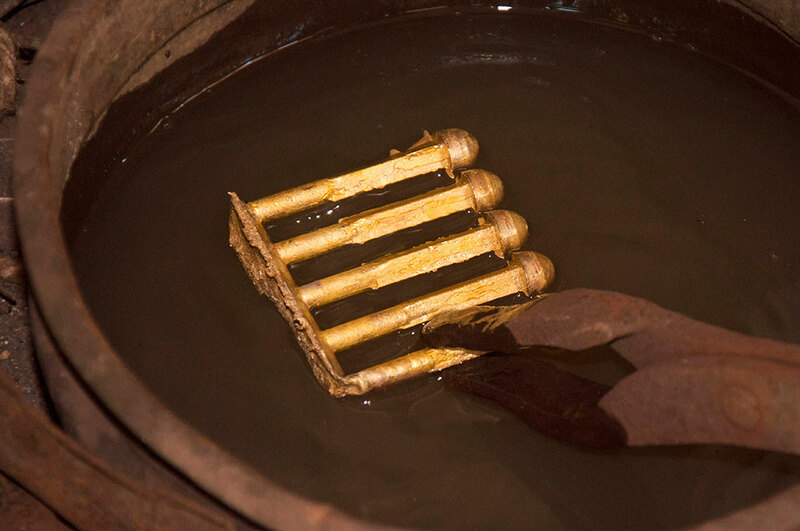 Waste pieces of brass are melted in the Ceramic Graphite crucible, which holds approximately 2kg of metal and takes up to twenty to thirty minutes by arranging the bricks around the blower. 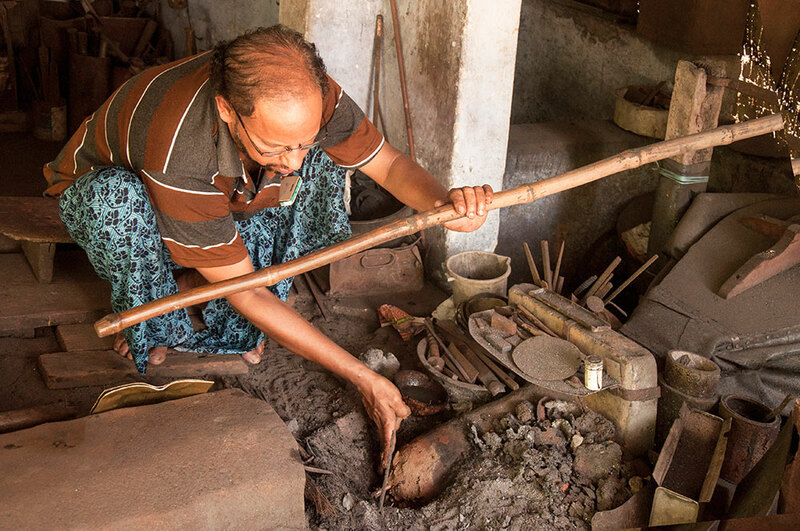 Coal made of coconut shell is used to melt the unused brass pieces for the sufficient heat. Namasaram is added and the dirt is removed from the molten brass with the help of rake. 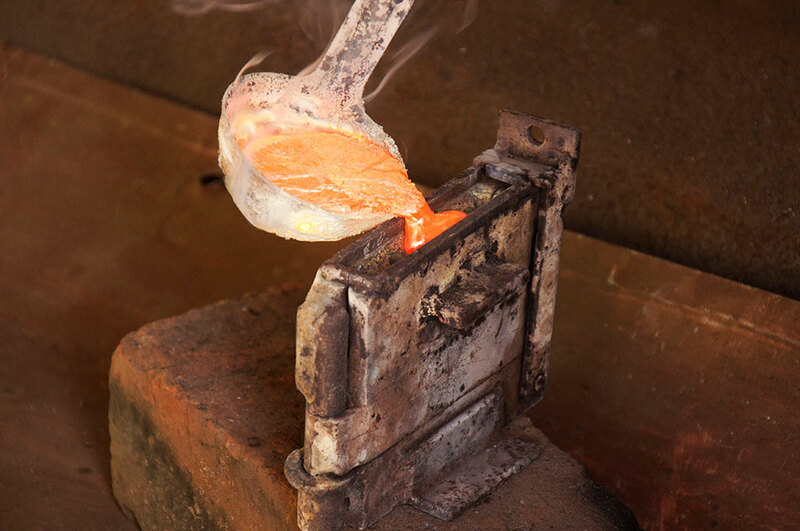 Using a wooden handed big crucible ladle, the molten brass is poured to the mould to make bolts for the lock. Once done with the moulding, the set of screws are dipped in normal water to make it cool.